Have you ever had a day when your children were crying due to hunger but the cupboards were completely bare and your bank account was empty? If you haven’t, you should consider yourself to be extremely blessed, because this is what real life feels like for millions upon millions of Americans in 2018. As you will see below, a third of all Americans cannot even afford “the basics” each month, and 13 million households are officially considered to be “food insecure”. In other words, they don’t have enough to eat. Many parents out there choose to skip a meal (or two) each day just so that their kids can have full stomachs. But sometimes the money runs out completely, and that is when it gets really tough. In recent years, the wealthy have been doing quite well, and many of them have very little sympathy for the struggles of the poor. Consider the following statistics. The average American can’t scrape together $500 for an emergency. A third of Americans can’t afford food, shelter, and healthcare. Healthcare for a family now costs $28k — about half of median income, which is $60k. Those are very sobering numbers, and you won’t often hear them repeated by the mainstream media. -Have you ever avoided taking a family member to the hospital because you were afraid of what the bill might look like? -Have you ever turned off your phone because you were sick and tired of getting calls from bill collectors? -Have you ever laid awake at night with a gnawing feeling in the pit of your stomach because you didn’t know how you were going to pay the bills at the end of the month? If so, you certainly have a lot of company. The truth is that most American families are deeply struggling, and those that are “doing well” make up only a very small percentage of the overall population. “Food is a struggle at times,” said Ryder’s mom, Kelly Ann Pfaffly, who also is raising a newborn boy. Of course Ryder and his family are far from alone. At this point, more than half of all U.S. households with children receive assistance from the government each month. The middle class is steadily eroding, and the ranks of the “working poor” have been growing rapidly. I stared potential landlords down with a seven-year-old standing next to me and a baby on my hip, asking to apply for a tiny studio apartment I could barely afford. I spoke to a dozen secretaries at local churches, asking if they had funds to help me pay for childcare. I went hungry and bounced checks to order pizza for dinner. Struggling to take care of my daughter on my own, I needed whatever government assistance I qualified for – a few hundred bucks a month in food stamps, free school lunches, childcare vouchers and coupons for milk and cheese – while I simultaneously worked as a maid, juggling 10 clients between going to class to put myself through college. Very few of my friends knew. They didn’t know the work I put into finding these resources – hours on the phone, standing in line, handing over thick packets to prove my need. It can be absolutely soul crushing to work as hard as you possibly can day after day and it still isn’t enough. It has been said that money can’t buy happiness, and that is true, but it can certainly make things easier. Americans in poverty are more likely than those who are not to struggle with a wide array of chronic health problems, and depression disproportionately affects those in poverty the most. About 31% of Americans in poverty say they have at some point been diagnosed with depression compared with 15.8% of those not in poverty. Impoverished Americans are also more likely to report asthma, diabetes, high blood pressure, and heart attacks — which are likely related to the higher level of obesity found for this group — 31.8% vs. 26% for adults not in poverty. After digesting these numbers, some of the things that we have seen happen politically in this country start to make sense. Americans are looking for hope, and so many of them keep going back and forth from one party to the other hoping that someone can come up with some solutions that will start to make their lives better. Unfortunately, our system has not been fixed, and we live at a time when the economy is beginning to really slow down again. During the last recession, thousands of businesses went under, millions of people lost their jobs and multitudes of Americans could no longer pay their mortgages. The same thing will happen again, and it will be very painful for our society. In the end, you have got to do what you have got to do in order to survive from month to month. At one time, America’s “endless prosperity” seemed like it would roll on indefinitely, but now we have entered a different era. Things are going to be tough during the days to come, and we are all going to need more flexibility than ever before. Contributed by Michael Snyder of The American Dream. 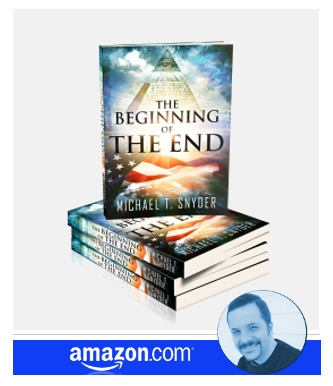 About the author: Michael Snyder is a nationally-syndicated writer, media personality and political activist. He is the author of four books including Get Prepared Now, The Beginning Of The Endand Living A Life That Really Matters. His articles are originally published on The Economic Collapse Blog, End Of The American Dream and The Most Important News. From there, his articles are republished on dozens of other prominent websites. If you would like to republish his articles, please feel free to do so. The more people that see this information the better, and we need to wake more people up while there is still time.